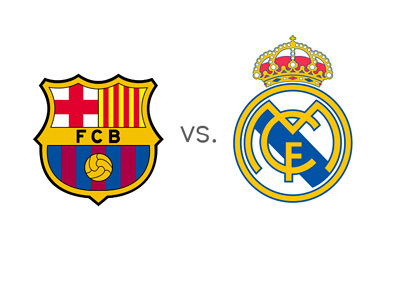 It will be a defining moment for both teams at the Nou Camp on March 22, Sunday night. Real Madrid's struggles of late have caused them to give away their lead in the La Liga standings to their bitter Catalan rivals, Barcelona. With only a point separating the two giants, Sunday's encounter could potentially decide who goes on to take the title when the 2014-15 season comes to a close in May. Barcelona wrapped up their Champions League - Round of 16 formalities with a comfortable 1-0 win over Manchester City on Wednesday and are into the next stage of the tournament. Their win over City marks their 18th in their last 19 outings much in contrast to a struggling Real who have won just two of their 5 games and that, too, against lowly Elche and Levante. The 2-0 win over Levante on Sunday saw glimpses of Real Madrid of the old. Gareth Bale scored a brace although both were from Ronaldo rebounds. It was his first in 10 games. Luka Modric's return from injury seems to have injected some life into the Real midfield. Along with Sergio Ramos coming out of a damaged hamstring, some of Los Blancos' true potential could see an unearthing of sorts going into Sunday's El Clasico. A genuine headache for Carlo Ancelotti has been Iker Casillas horror show between the posts. As if last month's four goals taken in from Atletico Madrid wasn't enough, another four from Schalke at home at the Bernabeu was the ultimate denouement. There were murmurs of replacing him with the Costa Rican goalie, Keylor Navas. But Ancelotti would probably go along with Casillas, given the veteran Spaniard's good track record in El Clasicos. Real could definitely put pressure on a virtually untested Barcelona goalie Claudio Bravo, who has not conceded a goal in his last eight appearances. This is also largely due to the the brilliant work at the back from Pique, Mascherano and Jordi Alba, who seem to be matching the skills of their famed forward line. There were flashes of brilliant defending by the Barca backline against Manchester City on Wednesday and even a return to form of the Ronaldo-Bale-Benzema combine will not translate into easy runs on the Barca goal. Isco would be expected to be creative at the middle but would need consistent support from Kroos and Modric. Caraval, Pepe, Ramos and Marcelo are expected to form the back line and will be severely tested by the Messi-Suarez-Neymar trio with Ivan Rakitic, too, joining the goal-party of late. Barcelona will be gunning for revenge at Nou Camp, having lost 1-3 when they last met at Bernabeu in October 2014. But the roles have reversed since then. A shaky Los Blancos will have to put behind them all their recent shortcomings in bringing off their very and ultimate best. It's only that kind of form that will help them overcome a virtually unstoppable Barcelona. Yes, the El Clasico will surely define where Real go from there. The Nou Camp showdown will be more of a test for a Real Madrid and Ancelotti in crisis, than for the hosts. The Madrid giant has a point to prove. Right now, it does not need a clairvoyant to tell who the favourites are. The bookmakers odds tell one what may possibly unfold at Nou Camp.